Home » Eye Diseases » What Is Astigmatism? What is Astigmatism? If your cornea isn’t shaped properly, your eyes may have difficulty focusing. This is known as Astigmatism. There are many types of Astigmatism. The human eye is like a camera. The back of the eyeball is the retina, and it acts like the film of the camera. The front of the eyeball is the lens of the camera, and consists of two parts. The outer part is the cornea, a hard surface which starts focusing light as it enters the eye. Just inside the cornea is a softer part called the lens. The lens is controlled with muscles, which enables us to focus our eyes. Between the cornea and the lens is another muscle called the iris, which controls the amount of light entering our eyes. What is Astigmatism caused by? Your cornea should be round, like a ball. However, if the cornea isn’t round, then the lens cannot focus the image onto the retina properly. You’re probably familiar with being nearsighted or farsighted — that happens when the cornea is rounded, but either bulges out a bit or not enough. In those cases the lens focuses the image, but either in front of or behind the retina. However, if the cornea isn’t actually round, but rather slightly oval looking from the front, then the image doesn’t focus at all. What happens is that the long part of the oval focuses at one point, and the narrow part focuses at a different point. There are three types of astigmatism. Myopic Astigmatism: Both of the points the eye focuses on are in front of the retina. Mixed Astigmatism: One of the focal points for the eye is in front of the retina, and the other is behind the retina. The three types of astigmatism can be the result of an oddly shaped cornea (corneal astigmatism), or an oddly shaped lens (lenticular astigmatism). Corneal astigmatism can be corrected with lenses or laser surgery. But, Lenticular astigmatism is less common, and may be addressed with contact lenses or laser surgery to the cornea to compensate. 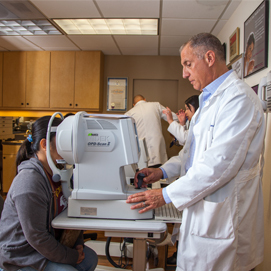 Dr. Leonard uses advanced technology to detect vision problems, like an astigmatism. Seeing clearly is difficult for patients with an astigmatism. Because you’ve made it this far, you now know what astigmatism is, and how it affects your eyes. An eye exam will help you find out if your vision problems are caused by one of the types of astigmatism. You might consider getting special contact lenses for astigmatism to help correct your vision. Dr. Barry Leonard is a specialist in diagnosing, prescribing and correcting for astigmatism. Make an appointment today. It’s easy! Call the office at 818-891-6711, or use the online reservation form. You’ll find it in the top left-hand corner of every page on this site. Just don’t wait until your vision gets worse. And, if things are clear and in focus, but it’s been more than a year since your last eye exam, it’s probably a good idea to stop by his San Fernando Valley office.